This is the third post in the series of Pakistan Bridal Fashion. If you have missed the previous posts, you can check it out here & here. A cocktail party is fairly a new concept. From the past 5-6 years, it’s become an extension of sangeet event. Not that any of us are complaining, who doesn’t like to party more? But the one question that I keep coming across from brides is, what should be my Indian Cocktail Party Dress? After doing lehenga and saree for the main events, a cocktail function is one event where the bride and her entourage can really experiment. Whether it is a fusion wear, a saree gown, or a western gown…there are ton of options. Today, however, I am sharing one particular designer’s outfits here that I think fits well with our cocktail outfit definition. Sana Safinaz is a Pakistan based designer who makes everything from bridal to pre-bridal wear. 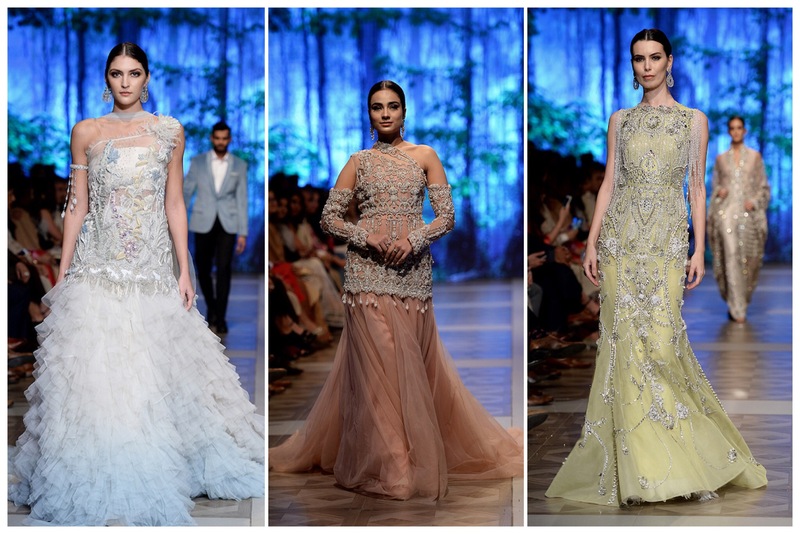 Her latest 2017 collection showcased in PFDC has a little something for everyone from the bride to sister of the bride, and mother of the bride also. Cocktail is one event where you can flaunt your style quotient with ease. Ruffles and over the top princess outfits are a rage in Indian Weddings these days. Make your groom wear a nice fitted suit to go with your outfit and you’ll make one hell of a stunning couple. I have always said this. The sister of the bride is the cynosure of all eyes at a wedding. She is the bubbly chirpy young woman who is seen and talked about the most at any wedding. Naturally, if you are a sister to a bride or groom, you have a tough task to choose the right bomb outfit to wear. Gone are the days when the options for mums used to be limited to saree or lehenga. Today mums are wearing everything from gowns to fusion wear and more. The above outfits are elegant, sophisticated yet stylish and comfortable to wear. Among Indian designers, you can check out Gaurav Gupta who does beautiful western gowns for Indian Brides. His sense of style is modern, edgy yet feminine making it perfect for cocktail or evening wedding functions. Do you know of any other designer/stores who are good for Indian Cocktail Party Dress?